Here’s why you should think twice about turning to that pizza pie or ice cream sundae after a long day. If this sounds like a trap you sometimes fall into, here are some healthy ways to have a better connection with what’s on your plate. Learn to practice mindful eating. Are you hungry enough to eat an apple? If not, then you’re probably not truly hungry. Rather you are bored or seeking emotional support of some kind, according to experts. “Emotional hunger, or the need for connection, empathy, compassion, etc., will never be filled by the physical means of food. [This] primes someone for an unhealthy cycle of shame and reward involving food,” explains Kelsey M. Latimer, Ph.D., psychologist and East Coast assistant director for outpatient eating disorder programs for Center For Discovery. Instead, she recommends mindful eating. This calls for a removal of all distractions (i.e. your smartphone, tablet, and TV) and engaging in the process and experience of food. “This means that we enjoy all of our senses and the eating process, including [what] the food looks like, smells like, taste[s] like, and even the experience of the texture of the food,” she adds. Avoid labeling foods as good or bad. For decades, our culture has reinforced a focus on control when it comes to food and meals. This has happened by labeling food as “good” and “bad.” Or, as Dr. Latimer explains, in more recent years, as “clean” and “not clean.” “Over time, these principles related to body control, importance of weight and shape, and labeling foods as positive or negative all began to move together. This primes us for being very unmindful eaters that have little-to-no concept of when we are hungry or full,” she says. “But, using ‘bad foods’ as a way to reward ourselves when we are ‘good,’ creates an unhealthy emotional relationship with food. As a rule of thumb, she recommends staying away from creating emotional associations with food by labeling them good or bad. Treat yourself to non-food rewards. You might be tempted to scarf down a meal or a snack when you’re starving. But try to eat slowly and mindfully. This not only helps satisfy your craving in a healthy way but also helps your body digest the food more efficiently. This can also help tell you when you’re full before you’ve overeaten. It takes around 20 minutes for your body to signal to your brain that you are, indeed, full. “Often, we are reaching for food to soothe emotions and anxiety. And often that comes from listening to our own inner critic all day,” explains Rogers. “But, beating yourself up only makes you feel worse. [It] makes you more likely to reach for food to soothe those uncomfortable feelings.” Instead, it’s best to allow some self-compassion into the picture. You have to be your own biggest supporter as you experience both success and failure. Doing so may make rewarding yourself with food less likely. Oftentimes, when we turn to food for comfort or support, it’s a sign that something deeper is happening. As Dr. Latimer explains, if you find yourself stuck in a powerful cycle of overindulging and under indulging, without the ability to break free of that cycle, it may indicate a need to reach out for help in shifting this process. “There are many professionals out there who can help us assess whether there may be reason for further concern and assistance,” she adds. It’s easy to fall into a cycle of rewarding yourself with food. Don’t get us wrong: We love to indulge and we certainly support eating your favorite foods. But try to incorporate small indulgences and those staple favorites more into your regular diet plans and meals for the week instead of as irregular rewards. Keep these foods in your home for well-balanced meals. 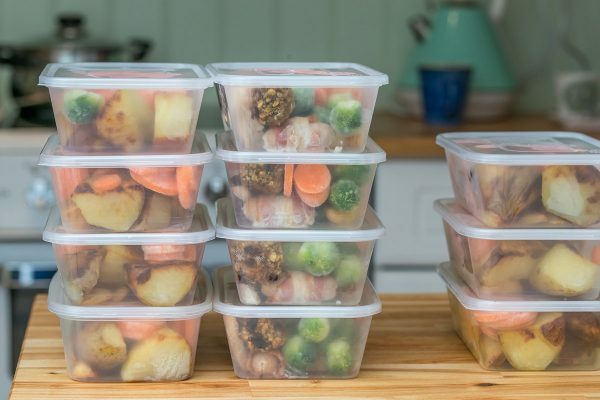 Take back control over your diet by avoiding these common meal prep mistakes.